I've been wanting to write about this for some time, but just haven't got round to it. For those that don't know, London implemented a "Congestion Charge" zone in 2003, whereby you have to pay a set price per day to drive into this area. This is to reduce the amount of traffic in central London. Today the London congestion zone charge went up from Â£5 to Â£8 a day - a whopping 60% increase. Now, I don't travel into London during the week, so I'm not directly affected by this, however I may be one day in the future. As I live a fair distance outside London, I'd probably catch the train into London... saves on the congestion charge, parking and the stress of getting stuck in traffic. However, this brings me onto my next point... the congestion charge in London appears to be working very well. Apparently the charge has cut the amount of traffic quite considerably. So, how is everyone getting into London then, if they're not driving? Simple, by train and bus - just what the mayor of London wanted. Now comes the next catch... apparently the trains are now so ram jam full during rush hour that the train operators are considering introducing a rail "congestion charge" for those travelling by train during peak times. Ummm, if they're only considering introducing this... why do I currently have to pay more to go into London during peak hours than off peak hours - isn't the charge already there? What next? Charging us for using the buses? Our bikes? Hey why not tax us for walking too whilst you're at it. Another good revenue earner for the govenment and local councils is speed cameras. These buggers pop up everywhere... the main road that runs parallel to our road has 2 within a mile of each other... they're so close you can see each camera from the other. However, the AA has pulled one back for the motorists. 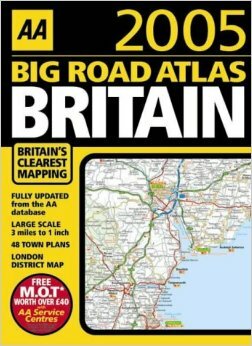 Last week they introduced their range of road atlases for 2006, which now include little icons indicating the location of all speed cameras. Now you can plan your journey to avoid as many cameras as possible. Nice one.